Giddy is a game based on Dizzy. 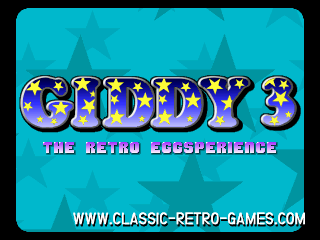 Giddy was originally released for Commordore Amiga but has been remade for Windows PC's as well. The game plays like any Dizzy platformer and is very enjoyable. The graphics are very old school and true to the Amiga original. If you enjoy this type of game, and who doesn't?, then be sure to download this free Windows PC remake of the classic Giddy.